We’ve been rafting the Tongariro River for a few decades now, but someone else has been braving the rapids for thousands of years before we came along: the Whio (pronounced Fee-Yoh) or Blue Duck! These plucky little birds are a joy to watch bobbing around the river. But they’re highly endangered and they need our help to survive. That’s why we co-founded the award-winning Blue Duck Project, a fantastic Turangi-based community initiative where local people can get involved in keeping our river Whio-friendly. And guess what? You can come and get involved too! TRR founder Garth is like a human Whio: he too spends most of his life in pristine, fast-flowing rivers (Garth probably eats less nymphs though!). So naturally he wanted to to help his fellow river-dwellers, and along with other local business owners he founded the Blue Duck Project in 2008. The project works with local businesses, landowners and a wonderful volunteer community to keep the Tongariro’s riverbanks predator-free. Since many areas of the Tongariro’s banks are only accessible by raft, it was a no-brainer for us to take responsibility for laying predator traps in these hard-to-reach areas. We’ve been maintaining these traps for a decade, and it’s starting to pay off! When we first started TRR, we rarely spotted blue ducks on the river. We now see Whio on around 90% of our rafting trips. Thanks to new styles of traps, more predators than ever are being caught, and the number of ducklings surviving has leapt from 30% to 90%. We’ve seen a phenomenal 1100% increase in the number of Whio on the river. You may already be carrying a Whio in your wallet: they’re the face of New Zealand’s $10 notes. They’re one of only three species worldwide who can live year-round in fast-flowing rivers like the Tongariro. Blue-grey with a chestnut breast, they blend in perfectly with the river rocks. Don’t be fooled by their tiny yellow eyes: they’re incredibly observant and will definitely spot you before you spot them! Whio have some pretty unique characteristics amongst ducks. Huge, oversized webbed feet allow them to navigate the Tongariro’s rapids like olympic champions, and the fleshy “lip” on their upper bill makes scraping juicy larvae off the rocks a breeze. 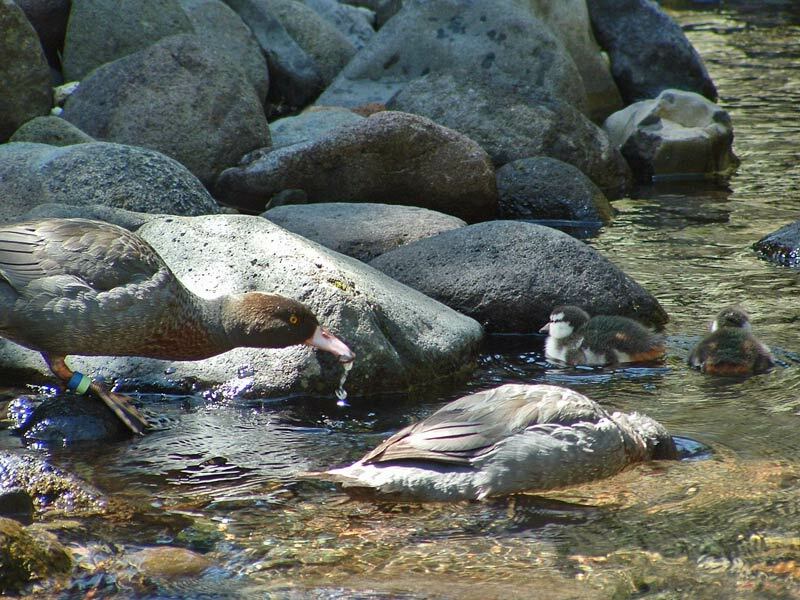 Under 3,000 Whio remain in New Zealand. They’re even rarer than some of our species of Kiwi. So what happened? Unfortunately, human settlers made life difficult for Whio by introducing predators to New Zealand. We brought stoats, cats, dogs, ferrets and rats, who kill their young and steal their eggs. Unlike other endangered New Zealand birds, we can’t relocate them to predator-free sanctuary islands to save them: these islands don’t have the long, turbulent rivers that Whio depend on. The clean-freaks of the New Zealand bird world, Whio are fussy about their living standards. Only pristine, fast-flowing, crystal clear rivers will do, thank you very much. The presence of Whio tells you that a river is healthy – it’s pretty flattering to get their seal of approval! Come out on the river and help us check our traps! 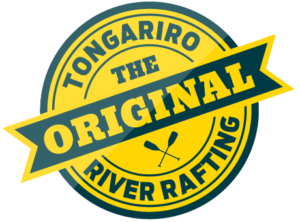 Our Blue Duck Rafting Experience lets you see first-hand how we keep the Tongariro safe for our feathery friends. You’ll raft along the river with us, making stops to check and reset the traps, likely bumping into a Whio or two on the way. With a proportion of the trip price going directly to the Blue Duck Project, you’ll be ensuring our work can continue for many years to come. The amazing success of the Blue Duck Project has gained heaps of press attention: we’re stoked to see Whio in the spotlight!